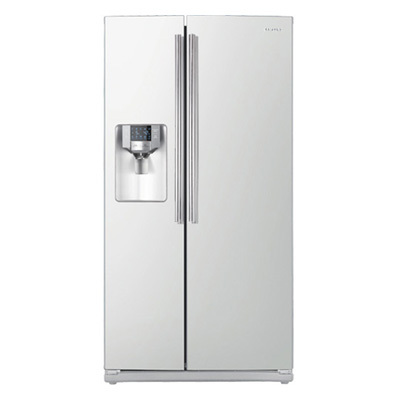 We have a large inventory of Samsung Side by Side Stainless Steel refrigerators as well as other brands and styles. Call or come in for best selection and price. Unlike other side by side refrigerators, this Samsung refrigerator has the innovative Twin Cooling Plus System that separates airflow from the refrigerator and the freezer to improve freshness. The refrigerator area stays more humid keeping fruits and vegetables fresher, longer. Humid air stays out of the freezer to reduce freezer burn, improving the quality of frozen food. Samsung's best-in-class LED lighting gently brightens every corner of your refrigerator so you can see better. Plus, the LED lighting in this side by side refrigerator emits less heat and is more energy efficient than traditional lighting. You'll save money while conserving energy with Samsung ENERGY STAR-rated refrigerators. Plus, a handy alarm alerts you when the door is left ajar or open too long.